I'm trying to start this post but I keep getting distracted looking at the picture. I'm so hungry right now (probably not a good idea to write about food when I'm hungry) and this dinner was so good that my mouth is watering just thinking about it. I picked up some bone-in split chicken breasts for roasting, but not yet sure what other ingredients I would use or how I would season them. 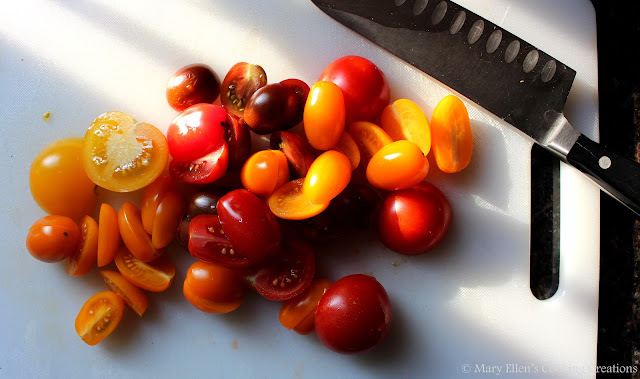 When I pulled them out to make dinner, I remembered that I had half of a container of assorted tomatoes left over from the previous night's dinner of grilled pork tenderloin with chimichurri and a side of oven roasted tomatoes. 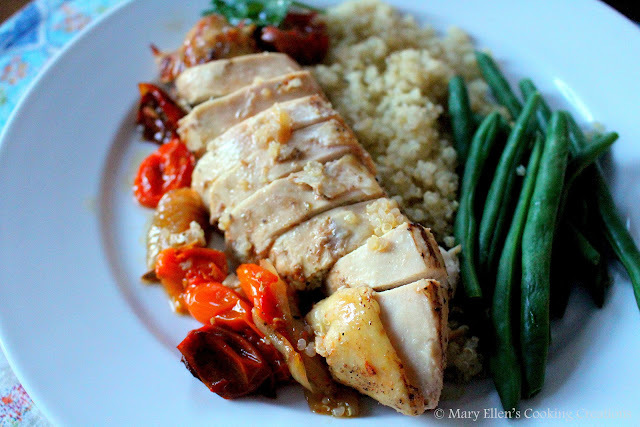 I loved the way these tomatoes melted in the oven so I wanted to use them again in this chicken dish. I also ended up using a flavor combination I have been using often recently - lemon and garlic, with the addition of some thyme and balsamic vinegar. All of these flavors combined so perfectly that I wouldn't change a thing about this recipe. 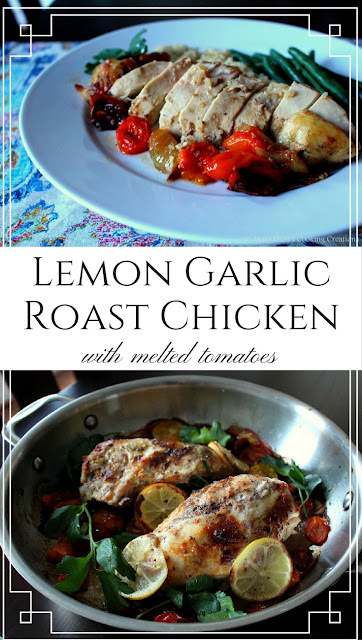 The chicken was juicy and really took on the lemon garlic flavors. 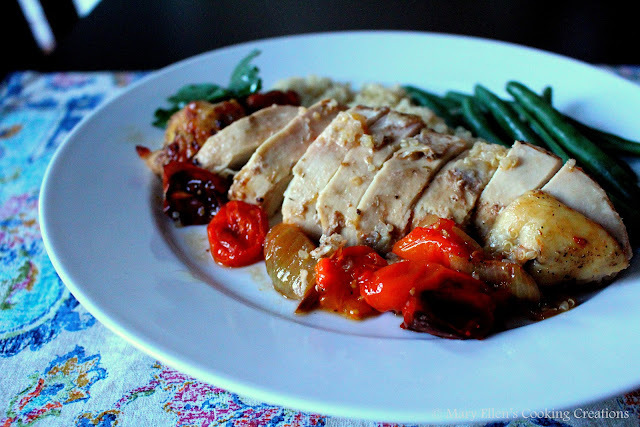 The tomatoes melted and formed a nice sauce around the chicken, and the balsamic gave the whole dish rich and deep flavor with some sweet notes. I served the chicken with quinoa and steamed green beans. Season the chicken with salt, pepper, and thyme. Gently lift the skin from the chicken and spread the oil/lemon mixture all over the chicken under and on top of the skin. 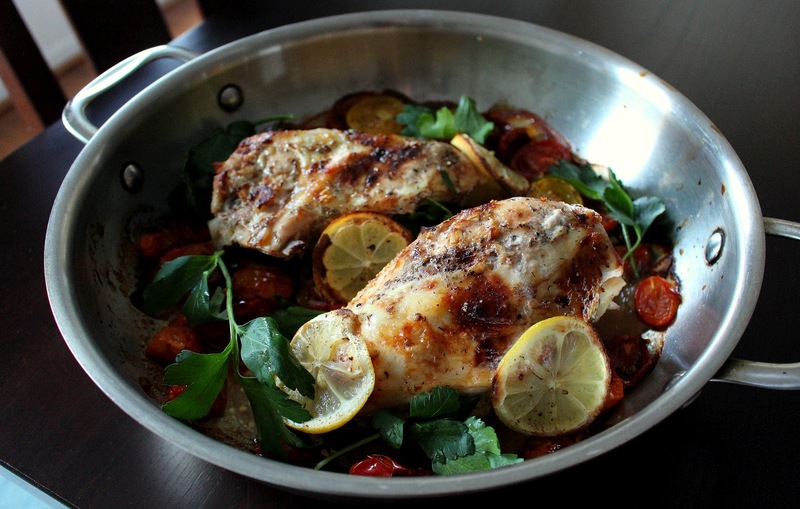 Place in an oven-safe baking dish. Roast the chicken for 1 hr - 1hr 20 minutes, basting occasionally with the cooking juices, until the internal temperature reaches 165 degrees. Let rest 5-10 minutes before slicing and serving. Beautiful! Such a nice summery dish. Bone in chicken breasts are the best!